White Tea is the least processed form of tea, made only from buds and select leaves of the tea plant. The finest quality white tea, Silver Needle, is made only from unopened buds and gets it name from the fine silvery white hairs on the buds. Beautiful and pleasant tasting, white tea was a luxury available only to the emperor of China. Now it has become available all around the world, albeit at a higher price than other teas. Like green, oolong, and black tea, white tea comes from the camellia sinensis plant. White tea is a specialty of the Chinese province Fujian. The leaves come from a number of varieties of tea cultivars. The most popular are Da Bai (Large White), Xiao Bai (Small White), Narcissus, and Chaicha bushes. White tea is fast-dried, while green tea is roasted in an oven or pan (while kept moving for even curing). Due to its minimal oxidation process, white tea retains higher concentrations of antioxidant flavonoids (catechins) than green or black tea, and thus is thought to have greater health benefits. While the actual effectiveness of white tea's medicinal properties are still to be determined, it is nonetheless an example of human creativity in making the most beautiful, nutritious food from one of nature's abundant resources. In hard times, very poor Chinese people would serve guests boiled water if they could not afford tea. Host and guest would refer to the water as "white tea" and act as if the tradition of serving guests tea had been carried out as usual. This usage is related to plain boiled water being called "white boiled water" in Chinese. However, true white tea is a specialty, formerly a luxury reserved for the emperor of China. A form of compressed tea referred to as white tea was being produced as far back as the Tang Dynasty (618-907 C.E.). This special white tea was picked in early spring, when the tea bushes had abundant growths which resembled silver needles. These "first flushes" were used as the raw material to make the compressed tea. Steamed, crushed, and poured into molds, and baked into cakes until dry. To prepare tea for drinking these cakes were roasted in the fire until soft enough to be crushed into a powder which was added to boiling water, often with flavorings such as ginger, orange peel, cloves, or peppermint. During the Song Dynasty (960–1279 C.E.) 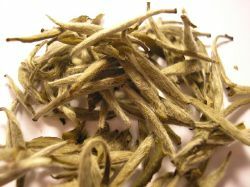 white tea was the choice of the royal court, given as tribute to the emperor. The cakes of tea were ground into a very fine powder and whisked in boiling water to produce a frothy liquid, more subtle flavorings of jasmine, lotus, and crysanthemum flowers replacing the spicier additions of earlier times. A version of this method of tea preparation is still found in the famous Japanese tea ceremony. Modern-day white teas can be traced to the Qing Dynasty in 1796. Teas were processed and distributed as loose tea that was to be steeped, and they were produced from chaicha, a mixed-variety tea bush. The white tea process differed from other Chinese green teas in that it did not incorporate de-enzyming by steaming or pan-firing. Also, the white teas that were produced from the chaicha tea bushes were thin, small, and did not have much silvery-white hair. It was not until 1885 that specific varieties of tea bushes were selected to make "Silver Needles" and other white teas. The large, fleshy buds of the "Big White," "Small White," and "Narcissus" tea bushes were selected to make white teas and are still used today as the raw material for the production of white tea. By 1891, the large, silvery-white down-covered Silver Needle was exported, and the production of White Peony started around 1922. White teas should be prepared with 185 °F (85 °C) water (not boiling) and steeped for around four minutes. Generally, around 2 grams (0.071 oz) to 2.5 grams (0.088 oz) of tea per 200 ml (6 ounces) of water, or about 1.5 teaspoons of white tea per cup, should be used. Many tea graders choose to brew this tea for as long as 10 minutes on the first infusion, to allow the delicate aromas to develop. Finer teas expose more flavor and complexity with no bitterness. Lower grade teas do not always stand this test well and develop bitter flavors or tannins. On successive brews (white teas produce three very good brews and a fourth that is passable), extend the time by a minute each brew. The third brew may require as long as 15 minutes to develop well. Temperature is crucial: If it is too hot, the brew will be bitter and the finer flavors will be overpowered. Antioxidants are destroyed at temperatures close to the boiling point, and the tea becomes astringent and loses some of its best qualities as the leaves are cooked. Single leaf of Bai Hao Yinzhen tea. The length of the leaf is approx 30mm. Bai Hao Yinzhen (Traditional Chinese: 白毫銀針, Simplified Chinese: 白毫银针) is a white tea which is chiefly produced in Fujian Province in China with only limited or negligible production outside. It is more commonly known just as Yinzhen. Amongst white teas this is the most expensive variety and the most prized as only top buds are used to produce the tea. Most Yinzhen is made from the Da Bai or Large White tea tree, however there are exceptions such as the Big Bud teas from Yunnan. This tea is best prepared with below boiling water (at about 75 °C (167 °F)) and produces a slightly viscous glittering pale yellow color with evidence of floating white hairs that reflect light. The flavor and fragrance should be delicate, light, fresh, and slightly sweet. Steeping should be for slightly longer than other white teas, up to 5 minutes, and the amount of tea to be used is usually higher. The taste is very mild which may lead to confusion and even disappointment when tried for the first time, especially since this delicate tea is rather expensive. Bai Mu Dan (Chinese: 白牡丹) is a white tea that includes new leaves as well as the center needle sprout. While widely considered to be a lower grade than Yinzhen, this is actually a separate category of white tea that includes grades of its own. Bai Mu Dan style is often preferred by white tea drinkers for its fuller flavor and greater potency than the Bai Hao Yinzhen style tea. The third grade of white tea, Gong Mei tea uses leaves from the Xiao Bai or "small white" tea trees. Shou Mei (Traditional Chinese: 壽眉; Simplified Chinese: 寿眉) is produced from naturally withered upper leaf and tips, with a stronger flavor reminiscent of lighter Oolong teas. It is mostly grown in the Fujian Province or Guangxi Province in China. Because it is plucked later than Bai Mu Dan the tea may be darker in color, but it should still have a proportionate green color. Some lower grades of Shou Mei may be golden in color with many black and red leaves, making a darker brew. Ceylon White tea is grown on the island of Sri Lanka and is highly prized, fetching much higher prices than black tea from the area. It is grown, harvested, and rolled by hand with the leaves dried and withered in the sun in the Nuwara Eliya region of Sri Lanka near Adam's Peak between 2,200 meters (7,200 ft)-2,500 meters (8,200 ft) above sea level. The tea has a delicate, very light liquoring with notes of pine and honey and a golden coppery infusion. Darjeeling White tea has a delicate aroma and brews to a pale golden color with a mellow taste and a hint of sweetness. It is grown in the rainy climate of Darjeeling in India at altitudes of 2,000 meters (6,600 ft) which make for a constant cool temperature. The tea is hand picked and rolled by hand and then withered in the sun, making it a rare and popular tea. 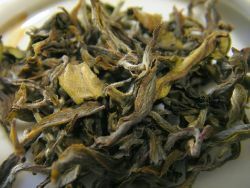 Darjeeling white tea leaves are very fluffy and light, and the tea has a distinct muscatel taste and honey fragrance. White tea production in the Assam region is rare. Much lighter in body than the traditional black Assam teas, a White Assam yields a refined infusion that is naturally sweet with a distinct malty character. African white tea is produced in Malawi and Kenya, mostly as Silver Needles (Yinzhen) type made of assamensis buds. It is usually higher in caffeine and richer in flavor than Chinese whites. White Puerh Tea is harvested in the spring from plantations found high on remote mountain peaks of Yunnan Province, China. Each step is processed by hand, and the tea is rich in fragrance, possessing a sweet nectar-like quality. Teas have been used for medicinal purposes in China for centuries. Nowadays, many in the Western world have become interested in these health benefits. However, many people in the West have a stereotype of the East as mystical and unscientific, which attracts those who have lost hope that science and western traditional medicine can cure the plethora of serious diseases and conditions which claimed the lives of so many in the twentieth century industrialized nations. In such instances, uninformed use of herbal "medicines," and teas can be included here, can do more harm than good. Scientific study of the impact of teas on health have revealed some positive and some negative effects. While all teas have biologically active components which may be beneficial, white teas may have the highest concentrations of antioxidant flavonoids based on the amount of oxidation they undergo during processing. White tea is made from buds and young leaves which are steamed or fired, a process that inactivates the polyphenol oxidase which causes oxidation of catechins, leaving higher concentrations of these potentially beneficial organic compounds. Health benefits that have been studied in relation to the drinking of teas include the following. Many epidemiological studies have examined associations between tea consumption and manifestations of cardiovascular disease, including myocardial infarction (heart attack) and stroke. Overall these suggest that daily consumption of at least three cups of tea may be associated with a modest (11 percent) reduction in the risk of heart attack. When compared to drinking less than one cup per day, daily consumption of five or more cups of green tea was associated with reduction in mortality from all causes and a 26 percent reduction in mortality from cardiovascular diseases, particularly in women. Despite promising results from animal studies, it is not yet clear whether increasing tea consumption helps to prevent cancers in humans. Studies have shown that green tea and black tea inhibited lung, stomach, and liver tumor formation in mice, and esophageal and colon tumor formation in rats. White tea has been claimed to be more effective that green tea in protecting against a range of cancers. Perhaps the most encouraging finding from animal experiments is that cancer inhibition by tea occurs at concentrations that are dietarily relevant. Thus, it is not unreasonable to expect to find that drinking tea will prove beneficial against cancer. Tea consumption has been positively correlated with bone density. However, further study is required to determine whether tea consumption affects the development of osteoporosis or the risk of fractures. Tea contains fluoride in concentrations comparable to those recommended for U.S. water supplies in order to prevent dental caries (cavities). Tea drinkers have been found to have significantly fewer dental caries than nondrinkers, even when the tea was black tea with sugar added. White tea is not drunk with sugar, and thus is even more beneficial for healthy teeth. A study at Pace University in 2004 showed white tea had significant anti-viral and anti-bacterial qualities. White tea extracts were reported effective at treating bacterial infections, such as Staphylococcus, Streptococcus, pneumonia, and dental caries, as well as fungal infections from Penicillium chrysogenum and Saccharomyces cerevisiae. Researchers reported that white tea extracts showed a greater effect than green tea extracts. Teas are generally considered safe, even when consumed in large amounts. Problems due to excessive consumption have been associated with caffeine toxicity. All teas contain caffeine, unless deliberately decaffeinated during processing. Decaffeination reduces total catechins in both black and green dry teas by about 15 times and 3 times respectively. The caffeine content is affected by several factors, both in processing and preparation of the beverage for drinking. Generally, black tea has a higher caffeine content than oolong tea or green tea. White tea usually contains buds and young tea leaves, which have been found to contain higher levels of caffeine than older leaves, suggesting that the caffeine content of some white teas may be slightly higher than that of green teas. Caffeine is an addictive substance and overuse of tea can result in harmful side effects, such as an increased likelihood of certain sleep disorders and other central nervous system symptoms such as agitation, tremors, dizziness, and confusion. Tea extracts have been shown to produce gastrointestinal side effects when taken in large quantities. Flavonoids in tea can bind non-haem iron (found in plants, dairy foods, and iron supplements) inhibiting its absorption by as much as 70 percent. As a result, to obtain adequate iron intake tea should not be drunk with meals or at the same time as taking iron supplements. ↑ Kit Chow and Ione Kramer, All the Tea in China (China Books & Periodicals Inc., 1990, ISBN 0835121941). ↑ 2.0 2.1 Jane Pettigrew, The Tea Companion (Connoisseur's Guides) (Running Press, 2004, ISBN 0762421509). ↑ Rhonda Parkinson, How to Brew White Tea The Spruce, February 15, 2017. Retrieved December 28, 2017. ↑ 4.0 4.1 4.2 4.3 4.4 4.5 4.6 Jane Higdon and Victoria J. Drake, Tea, Micronutrient Information Center, Linus Pauling Institute, 2008. Retrieved December 28, 2017. ↑ Roderick H. Dashwood, Tea Time (Tea and Cancer) The Linus Pauling Institute, 1999. Retrieved December 28, 2017. ↑ American Society For Microbiology, White Tea Beats Green Tea In Fighting Germs, Science Daily, May 28, 2004. Retrieved December 28, 2017. ↑ T. Bhagwat, et al., "Flavonoid composition of tea: Comparison of black and green teas," USDA Agricultural Research Service. Retrieved December 28, 2017. ↑ R. F. Hurrell, M. Reddy, and J. D. Cook, Inhibition of non-haem iron absorption in man by polyphenolic-containing beverages, British Journal of Nutrition 81(4) (April 1999): 289-295. Retrieved December 28, 2017. American Society For Microbiology. White Tea Beats Green Tea In Fighting Germs. ScienceDaily, May 28, 2004. Retrieved December 28, 2017. Arnold, Chloe. White tea—pick of the crop. BBC, 2004. Retrieved December 28, 2017. Bhagwat, S., G. R. Beecher, D. B. Haytowitz, J. M. Holden, J. Dwyer, J. Peterson, A. L. Eldridge, S. Agarwal, and D.A. Balentine. Flavonoid composition of tea: Comparison of black and green teas. Agricultural Research Service, USDA, 2003. Retrieved December 28, 2017. Higdon, Jane, and Victoria J. Drake. Tea Micronutrient Information Center, Linus Pauling Institute, 2008. Retrieved December 28, 2017. Hurrell, R. F., M. Reddy, and J. D. Cook. Inhibition of non-haem iron absorption in man by polyphenolic-containing beverages. British Journal of Nutrition 81(4) (April 1999): 289-295. Retrieved December 28, 2017. Pettigrew, Jane. The Tea Companion (Connoisseur's Guides). Running Press, 2004. ISBN 0762421509. This page was last modified on 28 December 2017, at 17:38.